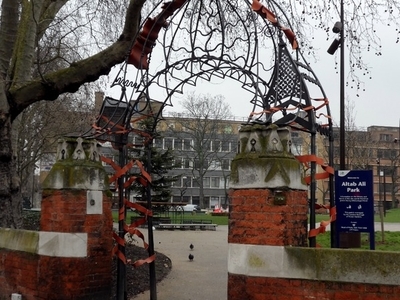 Altab Ali Park is a small park on Adler Street, White Church Lane and Whitechapel High Street, London E1; formerly known as St. Mary's Park it is the site of the old 14th Century white chapel, St. Mary Matfelon, from which the area of Whitechapel gets its name. Having been destroyed in The Blitz in 1940, all that remains of the old church is the floor plan and a few graves. 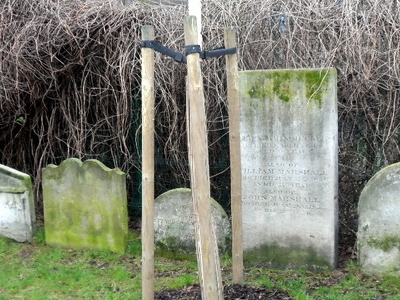 Included in those buried on the site are Richard Parker, Richard Brandon and Sir John Cass. This graveyard is the final resting place of 'Sir' Jeffrey Dunstan, Mayor of Garratt (died 1796 - see Hone's Everyday Book 1827, p. 859). The Park was renamed Altab Ali Park in 1998 in memory of Altab Ali, a 25-year-old Bangladeshi clothing worker, who was murdered on 4 May 1978 in Adler Street by three teenage boys as he walked home from work. At the entrance to the park is an arch created by David Peterson, developed as a memorial to Altab Ali and other victims of racist attacks. The arch incorporates a complex Bengali-style pattern, meant to show the merging of different cultures in East London. Along the path down the centre of the park are letters spelling out "The shade of my tree is offered to those who come and go fleetingly"; a fragment of a poem by Rabindranath Tagore. 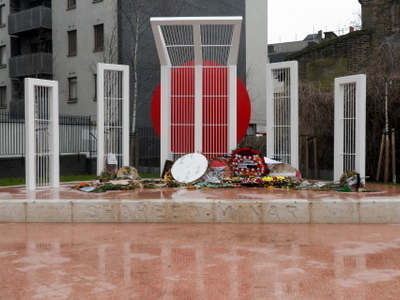 The Shaheed Minar, which commemorates the Bengali Language Movement stands in the southwest corner of Altab Ali Park; The Monument is a smaller replica of the one in Dhaka, Bangladesh, and symbolises a mother and the martyred sons. The nearest London Underground station is Aldgate East on the District and Hammersmith & City lines. Here's the our members favorite photos of "City Parks near London Borough of Tower Hamlets". Upload your photo of Altab Ali Park!